Going on a hiking trip to the Sawtooth Mountains in late August for 3 days out of the the Redfish Lake area. Would like to try and find some springs to soak in post hiking, just curious if there are any in the Stanely/Redfish Lake area that are clothing optional or should I expect to remain in a swimsuit? All good either way! 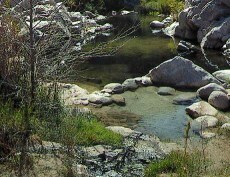 Can't wait to explore the area looks amazing, planning on skinny dipping in a few of the lakes while hiking. I know the water will be cold but if anyone has any suggestions on particular lakes then by all means let me know.